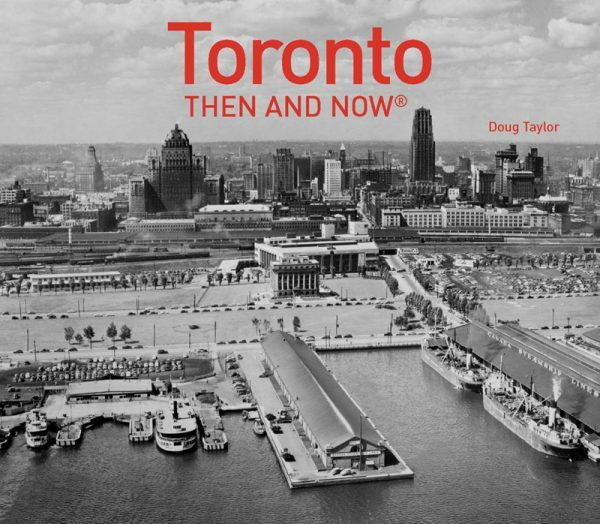 Toronto Then and Now is an elegant, large-format coffee table book that highlights the past and present of some of Toronto’s most interesting surviving older buildings and monuments. The book pairs archival photographs of the buildings, researched by author Doug Taylor, with modern photographs from a similar perspective, mostly by photographer Karl Mondon. Taylor accompanies each set of photos with a brief discussion of the design and construction of the buildings, interesting features, curious facts, the personalities involved, and its history to the present. (Disclosure: Doug Taylor is a former neighbour of mine). Browsing through the book, one is struck by the vibrant messy urbanism of a rapidly growing and changing city. In the early 20th century, buildings built in the same period, and even by the same architect, have quite different styles (e.g. E.J. Lennox’s neo-classical TD Bank on Yonge, compared to his Old City Hall) — and the styles evolve and change rapidly as the century progresses. The materials the city is built from are themselves a mix, some local to Ontario, some imported from abroad, often combined together. What’s more, as the city has grown, the context of these buildings has shifted and changed with the times. Some have been physically moved, to perhaps incongruous locations (e.g. the Queen’s Quay Lighthouse). Buildings that were once imposing (e.g. The Church of the Redeemer at Avenue and Bloor, the Harbour Commission Building) are now dwarfed by their more modern surroundings. Some buildings survive just as a facade, with a modern building behind them (e.g. the University Theatre). The book reminds us that facadism has a long history in Toronto – the St. Lawrence Market building, built in 1901, incorporates the facade of the previous City Hall buiding. On the other hand, the ROM is a case of almost reverse facadism, with old buildings overshadowed by Libeskind’s new crystal front. Some buildings have morphed over the years, adding or removing features as they changed use (Occidental Hall at Queen and Bathurst, the former Ostrovtzer Synagogue on Cecil Street). Other buildings survive intact and fully restored, but were repurposed many times (e.g. Montgomery’s Inn). Overall, the book serves to explore Toronto’s integration of the old and the new. The book includes its share of easily recognizable buildings, but one of its qualities is to highlight and provide some background about everyday but elegant buildings that have somehow survived a century or more right in the heart of the city, ones we may see regularly but take for granted — and perhaps suddenly notice one day, and wonder about their history (e.g. the Dineen building at Yonge and College, the Ryrie Building at Yonge and Shuter). The book proceeds in a roughly geographical fashion, starting at the harbour and working its way up. Most of the buildings are in the downtown area, with a brief excursion to the west at the end. The archival photos range from around 1900 up to the 1970s, but most are from the 1920s and 1930s. Toronto Then and Now is an attractive way to explore Toronto’s architectural history. The reader becomes familiar with some key architects who recur regularly, and Taylor highlights interesting decorative features to look out for. Various Toronto biggests, tallests and firsts are noted (the original flatiron building, the largest hotel in the Commonwealth), but not insisted on. But it is most valuable as a visual aid to meditating on the relationship between past and present in a young and rapidly changing city. Toronto Then and Now is available at the Spacing Store. You can borrow a copy of Toronto Then and Now from the Toronto Public Library. All you need is your library card to put a hold on the book. Or come down to the Toronto Reference Library and have a look at it on the second floor.